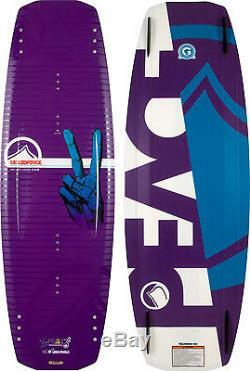 Liquid Force Peak Wakeboard 132. Nico von Lerchenfeld may not be a household name in the States, but our German friend has been turning heads overseas for years. Growing up at the cable, Nico has perfected his rail skills at a very early age and has quickly become one of the best, if not the best, rail rider in the world! He has proved that it's time for him to step out of the shadows, so we're introducing Nico's 1st world-wide pro-model release, The Peak. Featuring a grind base, aggressive 3-stage rocker, hybrid technology, and Liquid Rails this board has it all! Grind your way to the top with Nico's NEW peak! Hybrid Technology: have it all. A proven, performance hull shape and the great flex properties of our hybrid construction brings you a board that launches wake-to-wake, and delivers the goods for your park experience. LF Exclusive GRIND Base: The ultimate in durability from our sintered base material while maintaining the hull shape. Aggressive, Three Stage Rocker: For a straight up pop behind the boat, and catch-free transitions in the parks, this rocker style works great in both worlds. Center Concave with Edge Channels: Concave softens landing and maintains speed while edge channels increase control and hold. Liquid Rail Sidewall: Our elastomeric edges give you a rail with unsurpassed durability. The Liquid Rail will keep your ride together for session after session. CNC Milled Wood/PU Composite Core: Triple stringers give you ample tip flex with central control; all computer-milled with the perfect hull shape. Triax glass Layup: Our special weave provides torsional control while delivering the proper spring and snappy flex. Can accomodate bindings with a 6 inch binding plate. The item "Liquid Force Peak Wakeboard" is in sale since Thursday, March 09, 2017. This item is in the category "Sporting Goods\Water Sports\Wakeboarding & Waterskiing\Wakeboards".